"Photographic serendipity" is a phrase I've coined to describe what happens when me and my camera are in the right place at the right time. It also describes the phenomenon of my camera capturing something that my natural eyes don't see. And the term also encompasses the instances when a photographic "mistake" actually yields something I like. The latter is what happened when I shot the above photograph in winter 2009. I was out in the garden, enjoying a weird January heatwave and taking some shots of the few blossoms that were around. The orange and yellow gazanias (a native flower of South Africa that grows well here in the San Francisco Bay Area of California) were in bloom. Low to the ground and planted among rocks and other protectors, these stalwarts often bloom at odd times during the winter when everything else is dormant. 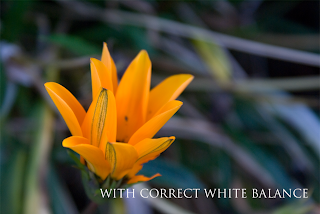 I was shooting the orange gazanias when I realized that I wanted to get some good "bokeh"* shots of the flowers. In order to create a shallow depth of field*, I switched my camera to a setting where the aperture* setting was dominant over everything else. Well, apparently in doing so, it also overrode any automatic white balance* adjustment my camera would perform which meant that since I was shooting in a slightly shady area of the garden, everything in the background behind the orange flower that was normally made up of greens and russet burgundy tones turned blue! When I first looked at the photos in preview mode on the back of my camera, I thought, "Well, those are throw-away shots." Fortunately, I have learned to not delete shots in the camera and wait until I get them back to the computer to toss out rejects. When I got back to the computer and looked at the shot bigger on my computer monitor, I realized that the white balance* "problem" was actually "photographic serendipity". The first thing that crossed my mind was that the orange gazania had a perfect backdrop of blue. 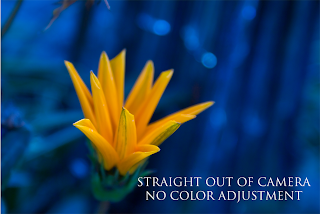 The reason it is the perfect backdrop is that orange and blue are complementary colors. Every color has a perfect complementary color. 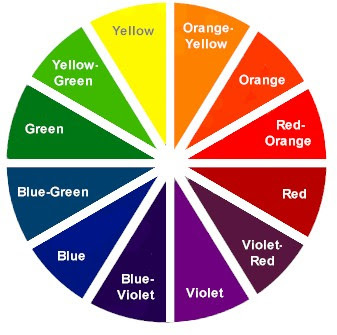 Complementary color pairs are determined by the simple circular color wheel. Colors that are directly opposite each other on a circular color wheel are a complementary pair. In a very simple color wheel there are the following complementary pairs: orange and blue; red and green; yellow and violet. The human eye likes looking at complementary colors together. Why? Because the human eye is the most comfortable when it can see the presence of all three primary colors (red, yellow and blue) in the same composition. The only way this happens when viewing just two colors is for one of the two colors to be a mixture of two primary colors. Orange is a mixture of red and yellow. Green is a mixture of blue and yellow. And violet is a mixture of blue and red. When one of these mixed colors is viewed with its perfect complement from the opposite side of a circular color wheel, the human eye just loves it and tells the brain, "Ahhhh... I like what I'm seeing right now. Everything is right with this picture." When I saw this "mistake" of a photograph up on the computer screen I realized that if I could brighten the oranges and deepen the blues, I could possibly have a really cool image on my hands because it was a perfect complementary color composition. With the color adjustment features in Photoshop, I was able to pump up the orange tones from the original image that came straight out of the camera ("SOOC" is the acronym). But it also made the blues a little greener than the original, lessening the complementary color impact. Then I got the idea that I should try using one of my Photoshop actions* on it. I only have a few Photoshop actions in my arsenal. One is to make a photo look like it was shot with a Lomo camera*. 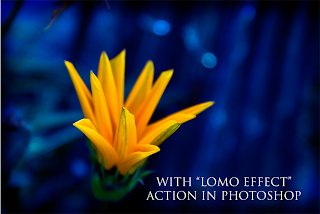 I happen to have a few Lomo actions that were free downloads. So I used one of my Photoshop actions that fakes the "lomo effect", and then the image really popped with the blue deepening behind the relatively untouched brilliance of the orange. As happens with a lot of my photographic work, if I stare at it too long I begin to doubt my own judgment. So I asked Hubby to come take a look. His reaction of "WOW! I think that is my favorite photograph you've done of all time!" was confirmation that I had done the right thing by following my instincts. So next time you think you've got a "mistake" photograph on your hands, you might want to take a second or third look at it. You could actually have a perfect candidate for a bit of "photographic serendipity".